Miss Utility | SignPost Install Inc. URGENT UPDATE: Today we were informed that Miss Utility also requires a call and marking for not only the wood signposts that are installed by digging a hole but also our metal signposts that are installed by using a small sledgehammer to place the metal stake that the metal post is anchored to. Through our fellow signpost companies out there, we were also told that Miss Utility is actively checking realty signpost installs they find against their database to see if there is a matching ticket on record for that installation. If none is found, fines are being issued. We know everyone wants their post installed immediately and it makes sense why. But moving forward ALL install requests, including metal posts will require that we place a request with Miss Utility and wait for them to clear it prior to completing the install. We aren’t happy about it either because it is actually much easier for us if we can schedule an install as soon as it is received from you. Did you know that all real estate sign post installs require that Miss Utility be contacted prior to its install? In a very recent email exchange, Miss Utility was helpful to explain the following to us. A real estate sign that can be pushed into the ground by hand or foot would not need a call. But if any excavating or tools are being used then they must be contacted first, it is the law! Miss Utility then has all the utility lines marked for safety reasons. Most understand that the standard wood post that has a hole dug needs a call. But even the newer, modern metal post using the metal stake require a call. Because a large hammer is needed to place the metal stake it falls into the category of needing a call. Do you know many installers are not calling and you and your brokerage are at risk. 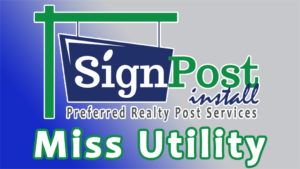 At Sign Post Install Inc. we contact Miss Utility each and every time. We record the ticket number they supply for our records and reference later. We will always do the right job the right way, you can count on that!